Funerals are a delicate subject and a difficult time. In some cases, grief may be too all-consuming to do anything other than survive. But in other cases, they provide a golden opportunity to gather family stories. More than once, I’ve heard spouses say that they learned new things about their beloved at their funeral… things they had not known in decades of marriage. Both family members and friends have memories and stories to share. Capture them! At my paternal grandmother’s funeral, we shared joyous memories. 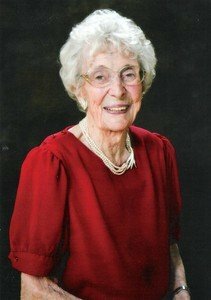 She was nearing her 101st birthday and had lived a rich, full, healthy life before we had to bid her farewell. There were several formal speakers on the program, but at the last minute, each of Grandma’s 12 grandchildren were invited to share a brief memory. Recently I found in my coat pocket the scribbled notes I made on a scrap of paper while waiting my turn to share. My little family has a tradition to celebrate Christmas early or late with Grandma; we’ve done this ever since our move to Logandale in 2005. I make homemade ham and bean soup, as well as warm round loaves of artisan bread, and pack it up for the trip to her cozy home in Las Vegas. Grandma always makes her traditional Texas Sheet Cake. This Christmas as we planned our celebration, she didn’t mention making the cake, and neither did I. At 100 years old, she was still living independently, but was starting to slow down. By her own admission, she was “starting to get old.” I assumed there would be no Texas Sheet Cake this year. As always, Grandma met us at the door with a warm welcome, big smile and hug for each of us. She was never impatient with my young kids full of energy in her tiny house. In fact, in my daily talks with her over the last nine years, she always asked about my husband and children by name. She knew what was going on in each of our lives. Yes, Grandma. Yes, you do. To me, this personifies some of my beloved Grandma’s qualities: consistency, devotion to family, selflessness and consideration for others, enduring to the end because of her firm reliance on the gospel of Jesus Christ. Family was everything to Grandma. She taught us what that means in everyday actions. The eleven other memories from my siblings and cousins were funny and poignant and wonderful. I wish I’d had the wisdom and wherewithal to record them. How I wish I’d known what I do now! Take those opportunities to capture memories wherever and however you can. Smart phones make it so easy to have the right tools at your fingertips. Precious family stories are worth preserving. If you found this helpful, please share on social media.